When you have a family it can seem impossible to stick with a budget or find ways to save money. There are always extra expenses with children growing out of clothes and shoes and the constant barrage of requests from the school for a few dollars here and a few dollars there for field trips or schools supplies or donations. Add to that the ever climbing costs of groceries and petrol and it is easy to see why so many families do not even bother with a budget. However, spending money without a budget is a dangerous and slippery slope. Without a budget it is unlikely you will save money and you will overspend. The combination of these two things means that you and your family will never truly be financially secure. Instead, follow a few steps to building a budget that your family can live with and that allows you to do the things you want without having to overspend. Plan Together – As parents you have the final say in how the money in your household is spent. However, if you allow children to have some input they will have a greater understanding of money which will help now and in the future. 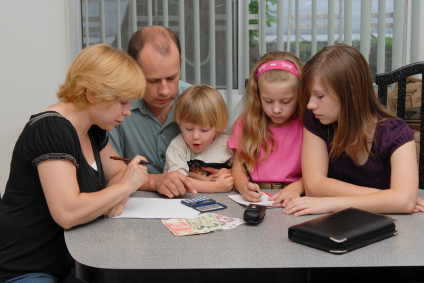 You should be comfortable talking about money with your children, even if you do not go into great detail. They can help decide how much they should get for an allowance and how much should be spent on their needs like clothing and school supplies. They will probably be shocked at how much maintaining a household actually costs, which will make them more respectful of the budget. Decide What Your Saving Priorities Are – Between retirement, college education, and holidays there are a lot of things to save for as a family. You will have to prioritise and set aside money accordingly, keep in mind that big things like retirement need the most money so start saving for these things early. Likewise long term savings can be put into investment accounts which earn higher returns but are more difficult to withdraw from while things like holidays should be in accounts that are easily accessible. Also, make certain you have an emergency savings fund that will cover your living expenses for three months in the event of an emergency. Use Cash Not Credit For Purchases – Spending cash keeps you on budget in two ways. The first is that the money you spend in finite, once you run out of cash you simply have to stop spending. The second is that it helps you to avoid racking up credit card debt and interest fees. The exception to this is if you have a great rewards program with your credit card. Just make sure that you use the rewards and that you never spend more than you can repay each month as paying interest always cancels out the value of the rewards. If you are not comfortable carrying cash all of the time a pre paid credit card is a great way to still live in a cash only world while still having the convenience of a credit card. The most important thing to remember when building your family budget is that key word “family.” If you keep everyone involved and working toward the same goal it is nearly impossible not to be successful. Remember to build some incentive and rewards into the system for the children and mom and dad. Everyone who sticks to the budgets should be rewarded for its success. Just make sure those rewards are noted and accounted for on your expense list! This article was written by Timothy Ng. You can read more of his work at Credit Card Comparison, where he has a number of comprehensive guides to help you compare credit cards. I think self-control is the most important part in preparing good family budget. Other things follow. Next post: How to Stop the Bleeding!